Recently the twins and I headed to the local science museum to meet up with their cousins. While there, we were lucky enough to get to pet one of their snakes, Shadow. They said Shadow has been around for so long that they have no idea how old he actually is. All three boys were quite brave and willing to gently touch Shadow. I think Cousin Grady was the least scared. Ironic, since my brother (Grady's dad) REALLY hates snakes. He'd better hope Grady isn't asking for a pet snake in a few years! Hey readers, how do you feel about snakes? I don't mind the nonpoisonous type, particularly in a controlled environment like this. I wouldn't want one as a pet, and I don't like being surprised by them outside, but they do no harm so I do them no harm. If I see a snake, I usually do a dance, hop up and down a few times... then I run away almost peeing my pants. I am a big sissy!! I like them at a distance! I think that I might have to draw the line at snakes :-) Looks like they were having fun though! There is a reptile zoo near us, so older boy has gotten used to petting snakes. I don't mind them, but like you, I would not want a pet snake. On that note, we have enough pets of all varieties. Eek! That makes my heart race. I am such a fraidy cat when it comes to snakes. The boys are sure cute!! i think they are beautiful. i don't mind them as long as i see them first. stepped down on a copperhead once in bare feet, felt the squish and lifted back off. thankfully he didn't strike. gave me a shot of adrenaline, though, i'd rather not repeat. Way to go, boys! Great pic! My husband has a pet snake. I have nothing to do with it, other than occasionally reaching in the cage to refill his water. I think we're going to try to find a good home for him,though. Oh I am affectionately known as the snake killer in my family. Ask Mary. It is so true. I learned it from my Mom. When she was nearing death, she would say "I hope all those snakes I killed don't have a chance to get back at me in heaven". Hahahaha. Cute how the twins have their little hands folded. I kill every rattlesnake I see, but the bull snakes I just let be. I don't like being surprised by any type of snake though. A fun experience. I have helped with surveys of local reptiles every year but sometimes they can catch me off guard and scare me a bit. I love snakes when they are in their natural habitat:) I wouldn't want one for a pet either. We have rattle snakes around here-I'm terrified of them! I hate it in the summer when Kona goes charging off into the bushes because I don't want her to get bitten. Those snakes don't always rattle before you practically step on them, either! Chills! I used to just ignore snakes until I got chickens and kept finding the black snakes eating our eggs. The place was infested with them so I started relocating or terminating them if they came back. I really like having them around to control rodents. i feel axactly like you do. they don't scare me in a controlled environment. if i happened to run into one ouside, i might freak out a little. my brother in law is absolutely terrified of them, even if they are behind glass. he's a grown man who screams when he sees snakes. I pretty much have the same feelings as you do -- we don't have any poisonous snakes here, so the ones I come across are fairly harmless. I just held a boa on vacation. It was just a baby though. Snakes are o.k. as long as they are not eating me. That is my motto. I'm not a fan of snakes. I might pet one if someone else was holding firmly onto it. Might. The boys look a bit stunned and kind of grossed out, but a very cute picture, one for the scrapbook! I hate and am terrified of snakes, same with Phil. The three of them are braver then I am. I'm not bothered by them UNLESS I come up on one that I didn't know was there.... like almost stepping on one. That's happened to me a couple of times .... and my heart leaps into my throat! I am not a big fan of snakes, however when touching one once many years ago I was surprise to realise how warm they felt. You would think they would be cold and slimy...but not at all. Oh dear that is brave of the boys. I have tons of stories about snakes. I used to like snakes when I was small. My brother and I would catch garden snakes and sell them to the neighborhood kids I was maybe 4 at the time. I had no clue which snakes to avoid. My brother just liked that I was not afraid to catch them. Then my cousin got bit by one and that was it I was no longer a snake catcher. What a great story, and I love the photo! I don't mind them as long as they're not poisonous... and even looked at them considering one for a pet for my son (he wanted one)... but when we found out we'd have to feed it either live or frozen dead baby mice, just couldn't do it. But I can handle them without fear. Ewwwwwwwwwww! Sorry...I hate snakes! But your boys are cute. I don't much care for them! The very title of this post made me shiver! I think it's because snakes are so startling. But twice in my life I've found a snake in my house and not panicked. One I was able to trap under a bucket and the other one I pushed outside with a broom! Eeek! This sends shivers down my spine. I have to say I am quite scared of snakes. One time when I got home, there was a big one waiting for me by the front door. My husband had to move him and he was hissing the whole time. I waited in the car! Oh lordy, children are brave. 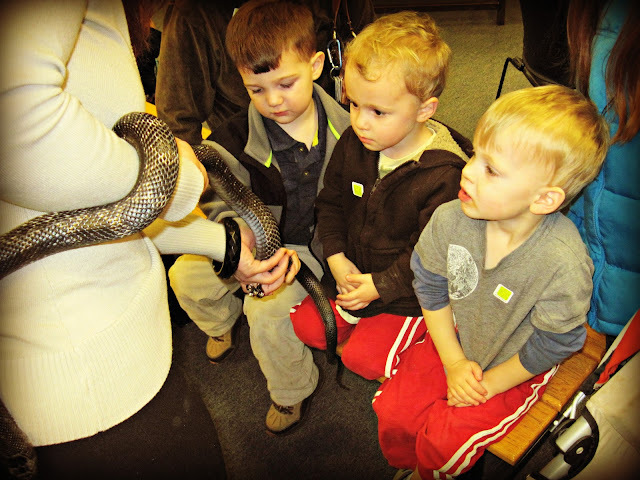 Deaglan recently went to a reptile museum with his class where the reptiles are live. He loved it! My bio dad used to have a boa & we would play wiht her all the time. It was when I was 2 or 3 so I don't remember all that well but my older sister remembers & has pictures of her holding the snake all the time. Such a cute picture! I would not want to find myself face to face with the deadly variety, but the others are fine. (outside.) They are just keeping the rodent population in check. We used to go to the Butantan "snake farm" when I was a kid in South America, to see all the different snakes and watch them being milked. They had a big science museum with amazing things like a leg that had to be amputated because of a bad snake bite. I know, kinda icky, but it takes a lot to gross me out. It's always cool to see how kids react to things...esp in a case like this. They look cautious but curious. Def not the reaction of many adults! I don't like snakes at all. We have had a rattlesnake here and they look just like the gopher snakes we get. I put out something called liquid fence each year to keep them away. I fear Skye getting in trouble with one. When we were kids, and there were still empty lots and prairies in the 'hood, we'd find all sorts of snakes. And while I wasn't big on catching them, I didn't mind holding them or touching them. It's sort of sad that kids don't find garter snakes outside anymore. Or fuzzy caterpillars. Sigh. I think they are missing out, even if they have x-box and such.